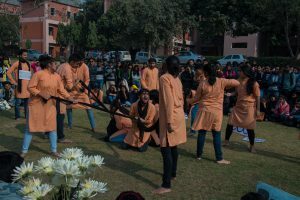 The Dramatics Society of ARSD College ‘Rangayan’ continues to enthrall audiences with its splendid performances while creating awareness on important socio-political issues. The session began with the NukkadNatak performance of Jan Gan Man on Founder’s Day, 3 August 2018.The session started with holding of auditions of students for Rangayanand thereafter an orientation programmefor freshers was organised on 17 August 2017. The chief guest on this occasion was Professor Devendra Raj Ankur, former director, National School of Drama and DrJaidevTaneja, an eminent theatre critic accompanied by the Principal,Dr G.K Jha and convener Ms Swati. The programme acquainted the freshers with the wonderful journey of Rangayan and the alumni students present encouraged our students to shed their inhibition, discover their talents and face life with utmost confidence. The Dramatics Society organized seven day theater workshop on acting skills for its students from 22-08-2017 to 29-08-2017 which was conducted by Professor Devendra Raj Ankur, Former Director NSD. About 70 students participated enthusiastically in the workshop and learnt the nuances of various aspects of theatre.He guided the students on how they can begin their journey into the field of theatre and the hard work and dedication required for the same. Dr. V.K.Arora ,Bursar ARSD College joined in the concluding ceremony and congratulated all students on successful completion of workshop.Certificates to all the participants were distributed. On 20 September 2017 our students performed a Street play on ‘ Swachh Bharat, Swasth Bharat ’ in the Festival, VimalPravah, Meghdoot III, SangeetNatakAkademi, RabindraBhavan. The performance was highly appreciated by everyone present and a memento was presented to the college in appreciation of the same. Abhinaysolo acting competition for freshers was organised on 25 August 2017. 45 students of first year participated enthusiastically and enacted various scenes related to social issues like dowry, acid attack, child sexual abuse, racism, hindumuslim riots, historic characters of rani laxmibai, mirabai, mangalpandey . The first prize was bagged by AmanSaraf(B.Sc.Honours), second position by KritikaSingh (B.Com Programme) and the third position was shared by Vikas Rai(B.Sc.Honours) and TanyaKalra (B.Com Programme). The three day theatre festival “RangsheershJaidev Theatre NatyaUtsav’ in honour of DrJaidevTaneja, the initial inspiration and founding member of the society was held on 6th and 7th February 2018 at Sri Ram Centre, Mandi House and on 8thFebruary 2018 in the College campus. The month long production oriented workshop under the guidance of Professor Devendra Raj Ankur and MrShyam Kumar began on 26th December 2017. On the first day of the festival, 6 february 2018 ‘Mrichkatik’ a classical Sanskrit drama with a political sub-plot written by Sudraka and adapted by Mohan Rakesh was performed by alumni students of Rangayan, which was directed by Professor Devender Raj Ankur and MrsMeeta Mishra. The chief guests for the event were Mr Mohan Mahirshi, renowned theatre person, Dr Dinesh Singh, ex- vice chancellor Delhi University and MrPawanJaggi, Member College Governing body. 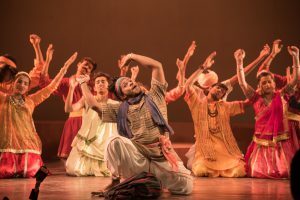 On the second day, ‘Bichchu’ written by Moliere, directed by Shyam Kumar and Himmat Singh Negi was performed by the college students.The chief guests on the occasion wereMrDiwan Singh Bajeli, writer and theatre critic and MrBanwaariTaneja. 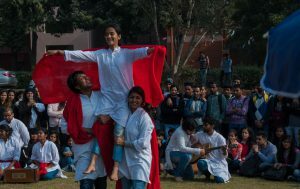 On the last day of the festival finals of the inter-college street play competition was held. The preliminary round took place on 1 february 2018. Twelve teams out of 45 teams qualified for the final round. The judges for the event were, Mr. Maneesh Minoja, a renowned theater activist,Mr.Sheokesh Mishra, Senior Assistant Editor of India Today and MrSangam Pandey, journalist and theatre enthusiast. The first position was secured by Navrang, the dramatics society of Institute of Home Economics, the second position by Sri Ram College of Commerce and third by Sri Ram College of Commerce. The huge participation in the event was evident of the popularity of the festival and the judges were greatly influenced with the various issues and social problems portrayed by the dramatics societies of various colleges. 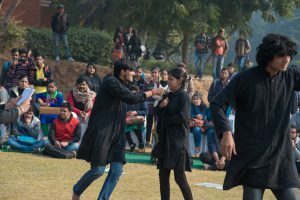 This year Rangayan came up with production of three stage plays ‘Dussman’, ‘Wasiyat’ and ‘Marnoprant’ and one Street play ‘Surname’ which received good review.The students staged the play “Dussman” at Antaragini 2017, the annual culture fest of IIT Kanpur.The play written by Daya Prakash Sinha is a comedy of errors satirizing human error.The play ‘Wasiyat’ was staged at ‘NatsamratNatyaUtsav 2018’ and ‘Sahitya Kala Parishad 2018’. This play written by BhagwatiCharanVerma is based on the present day scenario of the society where money matters over family members. 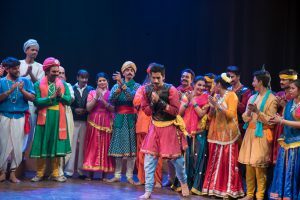 The play received good reviews all over.The play ‘Marnoprant’ was staged at National Theatre Festival 2018 organised by Rashtriya Kala Manch.Rangayan participated in the stage and street play competitionorganized by Sahitya Kala Parishad by performing ‘Wasiyat’(stage play) and ‘ Surname’(Street play). With hard work and dedication both the performances cleared the preliminary round and performed at the event. The street play ‘Surname’ participated in various competition and bagged a number of prizes along with best actor awards, best music, best script, special mention and special appreciation. The play makes one acknowledge our father to be the wonderful man he truly is, and see him as a dad again.The play ‘Surname’ bagged FIRST POSITION at World University of design ,Kalindi college,IIITD , Delhi Institute of Advanced Studies and Ambedkar Institute of Advanced Communication Technology and research.Rangayan received SECOND POSITION at Daulat Ram college, Vivekananda College, BITS Pilani, Bhaskaracharya College of Applied Sciences and Zakir Hussain College and bagged THIRD POSITION at St.Stephens college. 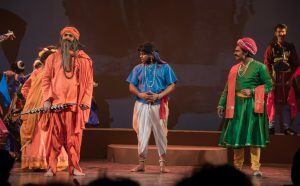 The play was also performed at Kalagrit-The essence of Indian art, Saitan Theatre festival and Theatre olympics atNational School of Drama. Apart from participating in competitions at festivals of various colleges Ranagyan also gave many public performances in places like Nehru Nagar, HauzKhas, Khan market, Faculty of arts etc.The play was appreciated and applauded by the audience in colleges like BVIMR, Institute of home economics , Daulat Ram college, Delhi college of arts and commerce, Indian Institute of law and management, Shaheed Rajguru college, Ramanujan college, St.Stephens college, Jamia Millia Islamia, University college of medical sciences to name a few. The play got best music award at New Delhi Institute of Management, best Script at Institute of home Economics and special appreciation by Ms. ShilpiMarwah at International Management Institute.